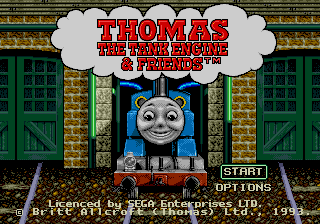 Thomas the Tank Engine & Friends is a 1993 US-only Sega Mega Drive game starring the characters from the children's television show Thomas the Tank Engine & Friends. The game, aimed towards the preschool demographic, has players controlling several different characters from the show's universe, including Thomas, James, Percy, Toby and Duck. Edward, Henry and Gordon also appear in the game mode with Thomas and James. The original Thomas title music is played at the title screen. This game features music from the first three seasons, and all text is spoken by Craig Ewert. The game has four components that make up gameplay: Game, Race, Explore and a coloring book section. At the start of the game, players are encouraged to enter their names as there engine drivers; there is a list of common names that are also selectable (Steve, Amy, Andy, et al.) for children who may not be able to write their name. From there, the player's engine is picked—choosing any of the outlined characters brings up a coloring book with pictures of each character, while selecting the colored-in Thomas skips this portion. The coloring book portion simply lets players fill in the image with various colors as opposed to any drawing. Players can select three difficulties: easy, medium and hard, which determine the difficulty of the Game and Race modes in the main game. The main Game mode has players fulfilling requests from Sir Topham Hatt to bring various trucks scattered throughout the course to stations—depending on the difficulty set by the player, this could involve one, two or three cars and multiple stations. 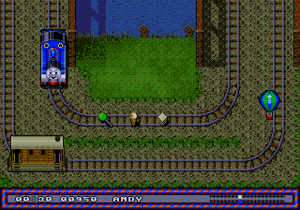 Players use the control arrows to navigate an engine on the tracks and to switch tracks when the path branches. Bumping into cars couples them to an engine, no matter if it's at the front or back of you. There are various candies and chocolates on the track which may be picked up for points, although points do not affect gameplay. Pressing will uncouple the trucks from an engine, starting with the outermost car. The button activates a steam engine's whistle; though it serves no purpose in-game, it creates a noise and shows a graphic of a steam engine's whistle blowing. Players who have forgot the request or need help can press to see the current objective. Hitting allows players to either start that level over or quit. Cars include Troublesome Trucks (mine and gravel), flat wagons (empty, logs and shape in different colors), Annie and Clarabel (who both look exactly the same). Stations include Knapford, Dryaw, Maron, Elsbridge, Brendam, Cronk, Crewe, Barrow and Shiloh. Once the correct cars have been brought to the station, they will be uncoupled and the mission will end and Sir Topham Hatt will praise the player's memory and/or speed, and the next request will be given. This process repeats in loop, regardless of how many missions there are. The Race game pits the player's engine against four others in a race to get to the end of the track. Two engines are set on separate tracks and will not meet each other, but players must control their engine as it races the track. Dirt patches on the track will slow an engine down and must be steered around causing an engine to give the player a sad face. 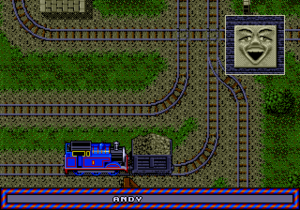 Floating balloons above the track change the speed of the train; balloons with a down arrow slow an engine down and cause an engine to give the player a sad face, while balloons with the up arrow increase speed and cause an engine to give the player a happy face. Solid-colored balloons are also on the track, but seem to serve no purpose aside from making popping noises. However, they do cause an engine to give the player a happy face. There are candies and chocolates on the track that may be picked up for extra points, but these additional points do not effect gameplay. However, sometimes there might be other engines trying to ruin your race by standing in the middle of the track; running into them will cause the player's engine to give the player a surprised face, regardless of which engine they've selected at the beginning of the game (in fact, in the hard skill level, the engine they are racing against will be faster and they could easily get ahead if it happens), and they will have to wait until another engine clears the track, so they'll be lucky if you make it to the finish line first without running into anything, except balloons with up arrows. In the event the player does not win against the computer, the course may be repeated indefinitely. The first race is against Toby, the second race is against Percy, the third race is against Duck, the fourth race is against James, and the fifth race is against Thomas. (The characters often switch around depending on the engine the player chooses at the start) Winning against three engines gives the player a silver medal and winning against all five gives the player a gold medal, ending the game. The Explore game is an open-ended world based on that of Game and Race modes. There is no stated objective; rather, players are free to roam around, picking up trucks, passing through stations and looking around the map. Main article: Thomas the Tank Engine & Friends/Magazine articles.